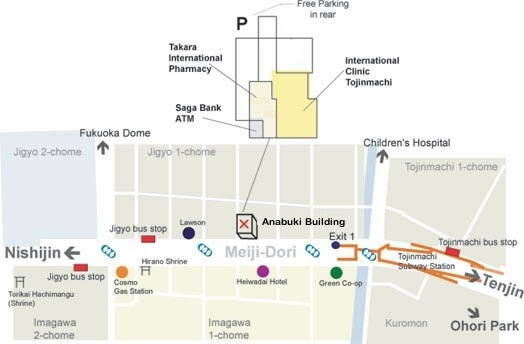 International Clinic Tojinmachi is located on the north side of Meiji-dori (Street), on the first floor of the Anabuki Housing Building midway between Ohori Park and Nishijin. Landmarks are the Heiwadai Hotel (business hotel) and the Green Coop which are across the street from the clinic. Free parking in the back of the clinic building. From the Tenjin Subway Station, board any subway heading toward Meinohama, Nishijin or Karatsu. Get off at the Tojinmachi Station, go to Exit #1, walk up the stairs and continue in the same direction for 2 short blocks. The Clinic is on the same side of the street as the subway exit. From the bus stop in front of Starbuck's on Meiji-Dori, board bus number 1, 3 or 5. Get off at the Jigyo Bus Stop, walk across Meiji-dori (Street), then head back towards Tenjin 4 short blocks. From the Hakata Subway Station, board any subway heading toward Meinohama, Nishijin or Karatsu. Get off at the Tojinmachi Station, go to Exit #1, walk up the stairs and continue in the same direction for 2 short blocks. The Clinic is on the same side of the street as the subway exit. From the Hakata Eki Bus Center (next to the station), board bus number 1, 2, 3 or 5. Get off at the Jigyo Bus Stop, walk across Meiji-dori (Street), then head back towards Tenjin 4 short blocks.